Kids’ meals are the same everywhere: hot dog, grilled cheese, chicken tenders and quesadillas. I don’t care if you are eating at Chinese Charlie’s Choppin’ Chopsticks Chack or Ira’s Italian Ice Cream Ice House, you’re getting the same THANG! 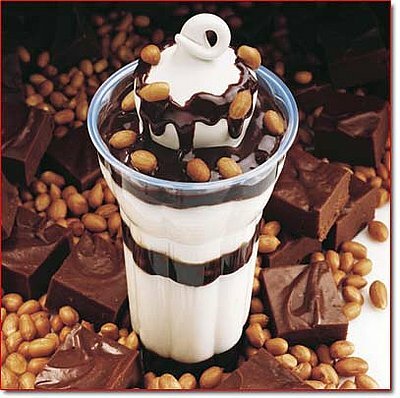 Ice cream toppings or “mixin’s” are no different- Snickers, M & M’s, Reese’s Peanut Butter Cups, etc. It’s time for a change! I can only change the world a taste bud at a time, though, so I have decided to start with ice cream. In just a few short days, I am bringing my large white cardboard (think Science Fair project) with pictures of my ice cream treats plastered all over it & presenting it to Marble Slab, Sonic, Cold Stone, Dairy Queen and Baskin Robbins. The thing is, I bought my poster board at Big Lots and it’s not either big nor does it hold a lot. I have to narrow down my 7 ice cream treats to only 3. Do you mind casting your vote?? #1 The Gizzard Blizzard– the choicest part of the gizzard will be blended with creamy soft serve for an afternoon delight you’ll never forget. Specify emu, turkey or chicken when ordering. #2 Brussel Sprout Buster Parfait– picture brussel sprouts where those peanuts are and get a napkin to wipe up your drool. #3 Ice Cream in a Falafel Cone– During the month of Ramadan, we toss the waffle cones and replace them with falafel cones. Falafel is made of ground chickpeas or fava beans. These are only served when the sun goes down. Anyone is welcome to try the tasty treat. These falafel balls on the right are stuffed with soft serve so you can stuff your face. #4 Banana Spit– served in small, medium and large. This is a drink. I will not reveal the source of spit, but will provide one single clue. It moos. #5 Ice Cream with Mixins, including peas, carrots, raisins, rock chunks, glass slivers, nails, mulch, etc. #6 Ice Cream Hamwich– nothing satisfies that sweet teeth like ham mixed with vanilla and chocolate. That pink ain’t strawberry. That is straight up pureed bacon. #7 Drumstick– Forget the Drumstick you grew up loving. This is a REAL fried chicken “drumstick” with a side of vanilla ice cream topped off with cream gravy. Deeeeeeeeeeeee-licious. *All come with a side of Pepto Bismol. Thanks for your help! I am confident I can secure a position on the menus of one or all of the aforementioned eating establishments. Wish me luck! I have been given three in the last couple few weeks and am just now getting around to recognizing them! Thank you TV’s Take for the “Foxy Mama Award” (I don’t know about all THAT), thank you to The Scoop on Poop for “The Chupacabra Award for Excellence” and thank you to Lesa Speaks Out for “The Versatile Blogger” award. You all are too kind! Part of the deal with receiving the awards is to give them away. It is a good opportunity for me to share some of the blogs I like with you all, even if the recipients let the award stop with them.